The maximum temperature on Sunday was 20.8ºC (69.4ºF) and the minimum 12.0ºC (53.6ºF). The maximum relative humidity was 71 per cent and the minimum 33 per cent. OUTLOOK FOR MONDAY: Cloudy sky. Rainfall: Rain or snow has occurred at many places in Jammu and Kashmir and at a few places in Himachal Pradesh. Weather was mainly dry in the rest of the region. Banihal, Batote, Pahalgam, Quazigund and Srinagar (Jammu and Kashmir) each recorded 1 cm of precipitation. Temperatures: Past 24 hours change: Minimum temperatures rose appreciably in Haryana, Himachal Pradesh, Punjab and Rajasthan, rose in Jammu and Kashmir and Uttaranchal and changed little in Uttar Pradesh. Departures: They were largely above normal in west Rajasthan, appreciably above normal in Haryana, Himachal Pradesh, Jammu and Kashmir, Punjab and east Rajasthan, above normal in Uttaranchal and normal in Uttar Pradesh. 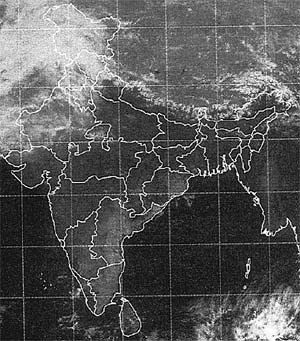 The lowest temperature in the plains was 8.5°C recorded at Amritsar (Punjab). Forecast valid until the morning of February 18: Rain or snow will occur at many places in Himachal Pradesh and Jammu and Kashmir and at a few places in Uttaranchal. Rain or thundershowers are likely at a few places in Punjab and at isolated places in Haryana and north Rajasthan. Weather will be mainly dry in the rest of the region. Heavy rainfall warning: Heavy rain/snow is likely at isolated places in Himachal Pradesh and Jammu and Kashmir during the next 48 hours. Forecast for Delhi and neighbourhood valid until the morning of Feb 18: Mainly cloudy sky with possibility of thundery development/light rain in some areas. Minimum temperature will be around 12°C. Farmers’ weather bulletin for Delhi: Forecast valid until the morning of Feb 18: Light rain is likely at a few places.